JNN 12 Sept 2014 Manila : The president of the overwhelmingly Christian Philippines proposed Wednesday to give Muslims in the south the ability to run their own government under their own flag, part of a peace plan aimed at ending a four-decade rebellion that has killed 150,000 people. The draft law submitted by President Benigno Aquino III to Congress fleshes out a peace deal signed in March by the country’s largest Muslim insurgent group, the 11,000-strong Moro Islamic Liberation Front. The autonomous region in the southern island of Mindanao, to be called Bangsamoro, would get its own 60-member parliament that would wield exclusive power over such areas as agriculture, trade, tourism and education. Under the proposal, Islamic Shariah law would apply to Muslims in the region, but the country’s justice system would continue to apply to non-Muslims. The Moro group has renounced the terrorist acts of extremist groups, including the Islamic State, which seeks to impose a harsh version of Shariah law in areas under its control in Syria and Iraq. 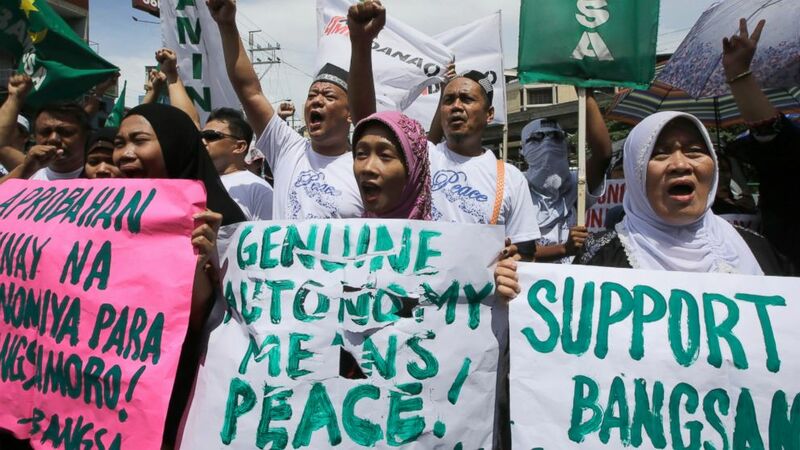 But at least three smaller Muslim rebel groups in the southern Philippines oppose the autonomy deal and have vowed to continue fighting for a separate Muslim homeland. The autonomous zone, which generally covers five provinces, would replace an existing one, seen as a dismal failure. The new plan grants much more autonomy to the region, and Aquino’s government also has promised to pour 17 billion pesos ($389 million) in special development funds over the next five years into the region, which has been stunted economically by the long-drawn conflict. The new region will also get larger revenue shares, including 75 percent of national taxes, fees and charges collected by the government in Bangsamoro. The current Muslim region gets 70 percent of those taxes. The rebels have been fighting since the 1970s for Muslim self-rule in Mindanao in an insurrection that has killed about 150,000 combatants and civilians. The United States and other Western governments have backed the autonomy deal partly to prevent the insurgency from breeding extremists who could threaten their countries. The peace accord and the draft law came after 13 years of tough negotiations. The Moro rebel group’s transformation has reaped praise amid worldwide alarm over the rise of the Islamic State group, which has been condemned for acts of brutality, including mass killings and beheadings. The broader autonomy given to the Muslim rebels mirrors the enhanced power, larger resources and other concessions granted by neighboring Indonesia to Muslim separatist rebels in its Aceh province under a 2005 peace deal. That peace pact has held. This entry was posted in Asia Pacific and tagged Autonomy in Philipines, Bangsamoro, Catholic Philippines, Filipino Muslims, Mindanao, Philipines. Bookmark the permalink.